New Mexico-based Optomec is well-known for both its aerosol jet technology, which is used to 33D print electronics, and its other patented AM process: LENS, which uses Directed Energy Deposition (DED) for high-value metal 3D printing. The company has been busy in the last few years, winning contracts and awards and providing resources on its technologies. 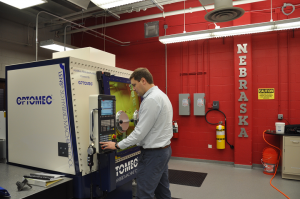 In 2016, the company first showcased its hybrid LENS Machine Tool series, which consist of a CNC Vertical Milling platform integrated with Optomec’s proprietary LENS metal 3D printing technology. This week at IMTS 2018 in Chicago, Optomec is introducing the latest addition to the series – the LENS 860 Hybrid Controlled Atmosphere (CA) System. The new large-format LENS 860 Hybrid CA System offers more capabilities for high-quality, affordable metal hybrid manufacturing, thanks to its higher laser power support and larger build volume of 860 x 600 x 610 mm. It features a hermetically-sealed build chamber that maintains moisture and oxygen levels below 10 ppm for processing reactive metals, like titanium, and can cost-effectively produce and repair parts.